For over a decade, LaCie Rugged drives have thrived where only the toughest survive - the film sets, photo shoots, and music studios of the world’s most influential creative pros. 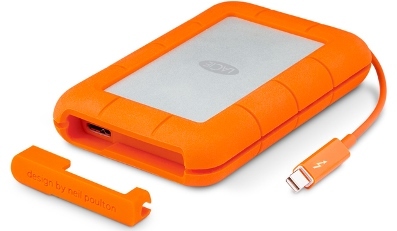 LaCie Rugged 2TB Thunderbolt speeds of up to 387 MB/s and USB 3.0 for universal connectivity. Bus powered for complete mobility and . Shock, dust and water resistant for all-terrain use With the new LaCie Rugged, even if you go off-road, your project stays on time. With IP 54-rated resistance to the elements and blinding-fast speeds through Thunderbolt and USB 3.0, you don't have to compromise between durability, mobility and speed. No-Compromise Speed Get lightning-fast transfer speeds on Mac and PC thanks to the USB 3.0 and Thunderbolt interfaces. 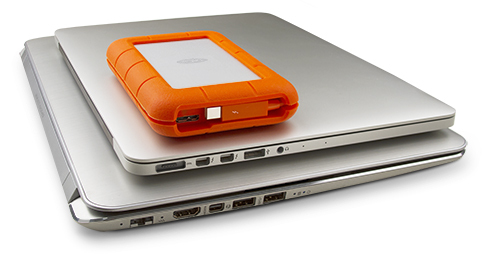 With the SSD version, the LaCie Rugged delivers up to 387 MB/s - one of the fastest bus-powered products available. The hard disk version performs at up to 122 MB/s, a 35% improvement over FireWire 800. Back up and transfer mountains of data in a fraction of the time. Enjoy noticeably more responsive photo library browsing. Universal Connectivity Don't let your project get derailed by incompatibility between your external drive and your computer. With both USB 3.0 and Thunderbolt interfaces, the LaCie Rugged is a perfect match for your Mac and PC. Since USB 3.0 is backward compatible, you can connect it to any standard computer, anywhere. The integrated Thunderbolt cable also stows neatly when not in use, so that you'll never lose it.